Can't remember where we got this, but it keeps growing. It's got a singular stalk with leaves with little points on them. Any idea what it is and how do we care for it? This lovely creature is an Aloe, of which there are many, many kinds. The fact that this plant is showing the typical growth habit of being deprived of light which is stretching or etiolating indicates that you need to put it in a brighter situation. These plants originate in extremely harsh desert conditions, with very thin air so they are exposed to high ultraviolet levels. When you grow them indoors, they don't get this intensity, and this is why they try and reach more light by making the stem part between the leaves longer (these are called 'internodes'). 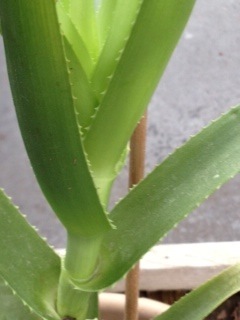 You can see more about Aloe here and here, including how to propagate them to keep them more compact. Hope that helps get your plant back on track and growing in a more typical (for it's genus) fashion.